First of all: Happy Martin Luther King Jr. Day to those in the United States who celebrate. I am spending my day off doing exciting things like washing laundry and cleaning my kitchen and getting this slightly belated than usual Marisole post up. I decided to use Margot since she’s new. After some thought, I have broken down the Marisole Monday category into sections for Margot, Marisole and Mia, my three different “faces” for Marisole, if that makes sense. The dolls can all share clothing. Sometimes an whole paper doll set comes out of my desire to draw a single outfit. In the case of today’s paper doll set, it was the high-waisted plaid skirt and the tie. So, after I decided I wanted to draw that then the rest of it came together along similar lines- lots of pleats and a sort of “school girl gone wrong” kinda vibe. One of my favorite paper dolls blogs has a new address. A Time For Paper Dolls used to be Inflammation Of… and I am really enjoying her dolls. I love their clean crisp lines and simple shapes. If I had small children, I would totally print these out for them and I might just color a few on my own for fun. I totally make my own fun. Awe thanks! I am actually hand drawing and just scanning in my new ongoing set- as i have just grown so irritated drawing in photoshop. I was worried about how they would come out- but i am at least once again finally enjoying the process, in the end that will produce better! 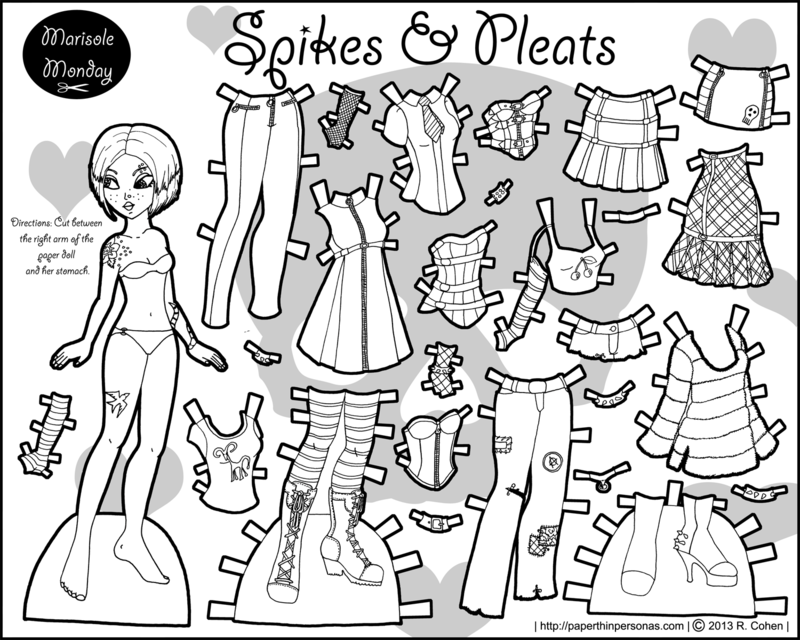 And grown ups can have fun coloring paper dolls too! My girls and i really enjoy coloring and cutting and black and white paper dolls together. By the way i love the striped stockings. I for some reason have a little bit of a fascination with tall striped socks for paper dolls! Oddly enough i rarely draw them in mine…. might have to change that! I share your fascination with striped stockings on paper dolls… I recently found a set of mine from when I was in high school and… they all had striped stockings. Odd that.